Wahoo International’s Gary Fisher designed and manufactured the first LifeSled PWC Rescue Board back in 1990 at the behest of Hawaiian lifeguards Brian Keaulana and Terry Ahue. Since then every LifeSled has benefited from over 28 years of R&D and field testing by industry’s finest watermen operating in worlds most extreme conditions. Our long history has given us a deep understanding of how rescue sleds behave while being towed behind jet skis in tumultuous water, and has yielded boards that are stronger, safer, and more stable than any other competing product on the market. Our LifeSleds are designed to last for many years and don’t include extraneous gimmicks that can hurt people in immediate need of help. You won’t find any parts protruding through our thoughtfully designed rescue boards or anything else that can come loose and hurt someone. Our rescue boards are overbuilt for turbulent water conditions to enhance the performance and stability of both the rescue sled and the boat pulling it. The LifeSled Difference, Why 28+ years of field testing by First-Responders and Big Wave Surfers in extreme conditions make our water rescue boards better. Wahoo International’s Gary Fisher designed and manufactured the first LifeSled PWC Rescue Board back in 1990 at the behest of Hawaiian lifeguards Brian Keaulana and Terry Ahue. Since then, every LifeSled has benefited from over 28 years of R&D and field testing by the industry’s finest watermen operating in the world’s most extreme conditions. Our long history has given us a deep understanding of how rescue sleds behave while being towed behind jet skis in tumultuous water, yielding boards that are stronger, safer, and more stable than any other competing product on the market. Our LifeSleds are designed to last for many years and don’t include extraneous gimmicks that can hurt people in immediate need of help. You won’t find any parts protruding through our thoughtfully designed rescue boards or anything else that can come loose and injure someone. Our rescue boards are overbuilt for turbulent water conditions to enhance the performance and stability of both the rescue sled and the boat pulling it. The importance of our three-point hookup system can’t be overstated. There isn’t a stronger water rescue board that will outperform or outlast a solid core LifeSled. Pound for pound, LifeSled is the best value in water safety and when used in combination with our custom fit Transom Adaptors, the LifeSled’s three-point connection smoothly pivots 45˚ laterally and moves in harmony with vertical surface water undulations. Our super-strong lateral Bungee Stabilizers are engineered to allow the LifeSled to remain extremely maneuverable through turns and deploy the perfect amount of tension to cushion centripetal force. The large displacement three-point connection is supported by not just one but three full-length aluminum stringers. This combination minimizes stress on tow components maximizing the LifeSled’s unmatched strength-to-weight ratio. Our water rescue sleds simply don’t crease or fold like competing products. If industry-leading strength and maneuverability aren’t enough for you, consider that our rescue boards can be attached to a personal watercraft in less than three minutes using our Quick Release Snap Shackles. While competing products offer a one-size-fits-all approach, our vacuum-formed, high-impact ABS Transom Adaptors are custom fit to each type of personal watercraft. Our Transom Adaptors extend the rescue board’s fulcrum further toward the back of the boat, keeping the rescue board in the water instead of flopping around on the rear deck surface. The unique shape of the Transom Adaptor acts like a pocket for your LifeSled’s nose to fit into. 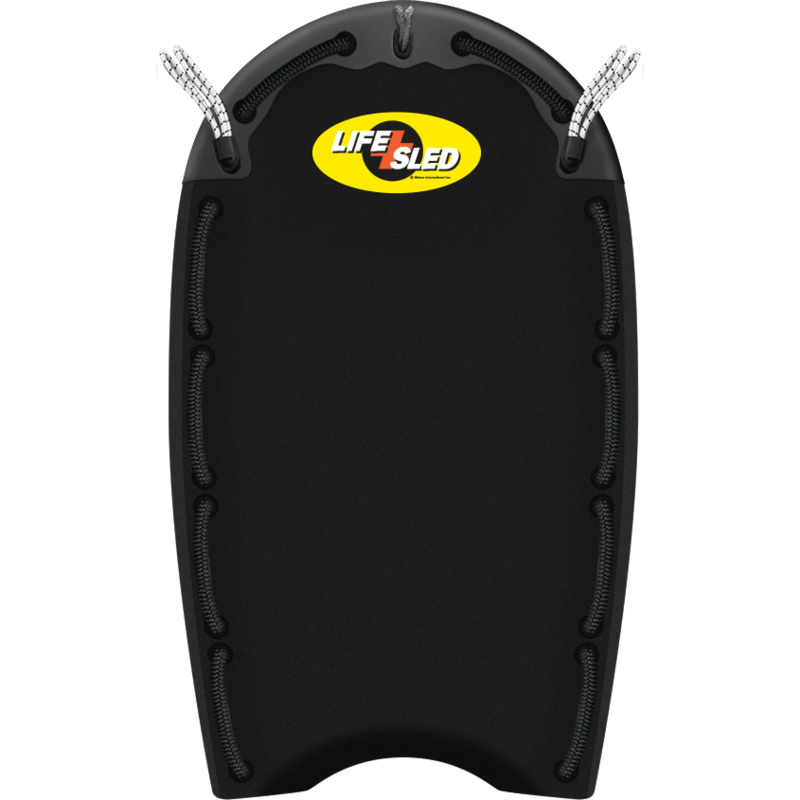 Exclusive to LifeSled, this marriage allows the rescue board to smoothly rotate through turns and comfortably respond to vertical undulations on the water’s surface. This makes for safe comfortable transport and much-improved boat control, improving stability when pulling a water rescue board through rough water and high foam conditions. If better control and safety weren’t enough, moving the connection point further back lets the LifeSled rest on its impact resistant Nose Guard. Working in combination with LifeSled’s three tempered rigid aluminum stringers means your LifeSled won’t fold or crease ending its life prematurely. Instead, wear and tear are absorbed by the Replaceable Nose Guard and not the personal watercraft or the rescue sled itself. The LifeSled’s rail geometry has been optimized to function in perfect harmony with the underway dynamics of a jet ski. More extreme than a body bodyboard’s rails, the 70/30 rail to chine ratio allows for deeper sled tracking. This edge works in tandem with an optimized curved outline that improves the overall stability of the boat and rescue board setup while still allowing the driver to break loose for quick turns. We can’t be vocal enough on how important it is for a rescue sled to work in harmony behind a jet ski through thick sea foam and turbulent waters. Nature is unpredictable and we have engineered these rails to help keep your boat stable with good maneuverability unlike some of the flat rail rescue boards available today. With over 28 years of research and development by top engineers and watermen, we’re confident our water rescue boards are not only the strongest but also the safest solution to date. Custom-molded from UHMWPE, our extremely impact and abrasion-resistant nose guard protects the PWC’s transom and rescue board from undue wear and tear. Unlike other water rescue sleds, our nose guard improves boat handling with its bullet shape, allowing smooth undulation against our custom fit transom adaptors. Though our nose guards have immense compressive strength and won’t warp under intense sun for many years to come, we do offer replacement nose guards. In dangerous, rough-water conditions everything counts. Every LifeSled is a result of over 28 years of research and development, tested by the industry’s finest watermen operating in extreme conditions worldwide. The LifeSled’s rail geometry has been optimized to function in perfect harmony with the underway dynamics of a personal watercraft. LifeSleds don’t just drag behind jet skis like competing boards, they release water in a calculated way that actually improves the watercraft’s stability and handling while tracking through thick sea foam and turbulent waters. Our rescue boards are long enough to keep a person comfortable yet does not impede maneuverability. The swallow tail’s outline helps to facilitate the centering of an incapacitated body when being pulled aboard. The tail design is not only comfortable for a victim being pulled to safety but its perfect pitch allows a paddling surfer to drive right up onto the sled to be swiftly and efficiently pulled to safety. While competing rescue boards equipped with single-sheathed 12mm bungee stabilizers offer “some” lateral control; we aren’t interested in just “some” control. LifeSled’s double-looped Bungee Stabilizers are made from half-inch marine shock cord and double-sheathed for safety. At more than double the strength of competing offerings, our Bungee Stabilizers keep your LifeSled firm yet flexible enough to pivot 45˚ and accelerate out of critical situations without whipping the victim overboard. In the heavy conditions, bones break and things happen; that’s why our stabilizers use our proprietary I.B.S. Connections (Intelligent Breakage System). This means that female receptacles are stronger so that the less expensive and quick-to-replace male inserts break first. The female end of the I.B.S Connections are set into the LifeSled’s core using a secret blend of adhesives designed for strength and impact resistance. This keeps the hull’s surface smooth and intact for better tracking behind a ski. The replacements stabilizers simply screw into the LifeSled’s robust one-inch NPT fittings. Some suggest our Bungee Stabilizers are overkill, but when your life on is the line or your job is all about water rescue… Then nothing less will do. Tail shape takes on a particular importance in the LifeSled’s design. The highly-optimized swallow tail used in our water rescue sleds helps to translate the passenger’s weight to proper tracking and water release for improved handling. Its comfortable surface is made from a hypoallergenic cross-linked polyethylene that has an excellent resistance to chemicals allowing it to be washed and sterilized by bleach, soaps, or alcohol. By default, the tail is colored in the same colorfast, weatherable material as the abrasion resistant and tacky-when-wet deck. The LifeSled’s curved tail outline helps to facilitate the centering of incapacitated victims when being pulled aboard. The tail design is not only comfortable for a victim being pulled to safety but its perfect pitch allows for a paddling surfer to drive their surfboard right up onto the sled’s deck to be swiftly and efficiently pulled to safety. Precision is the name of the game when it comes to our rescue boards. Each LifeSled begins with a precision CNC-machined shape and is the only rescue board strengthened by not just one but three reinforced, tempered aluminum stringers that run from the board’s bow to its stern. The tow bar is integrated into the center alloy stringer for maximum strength and welded to the board’s core using a special blend of urethanes and epoxies for maximum adhesion and impact resistance. Each fully-sealed board is built with lapped seams for maximum strength. Handles and bungee anchors are embedded using proprietary adhesives, resulting in super-strong bonds. Because all extraneous fittings are internally anchored and don’t pass completely through the board, the LifeSled’s hull remains intact without protruding parts like competing rescue boards. This process not only reduces wear on the board but renders a smooth, stable bottom skin that rides over undulating seas and thick foam with ease. Constructed with modularity in mind, our parts are quick and easy to replace. Anytime you set out to create the best, it kind of goes without saying that the finest materials will be involved and the same can be said for our LifeSleds. With each new revision, materials are scrutinized for both durability and sensibility alike. Each LifeSled is a composite of materials with extreme characteristics; at the center of our rescue boards, you will find a precision CNC-machined linear low-density polyethylene core that exhibits extreme shock absorption and thermal insulation. This core is reinforced by the industrys’ only tempered aluminum stringer system that is both rigid and impact resistant. This triple array of alloy stringers runs throughout the length of the board and prevents folding or creasing common in other sleds over the PWC stern. Our durable decks are made from a comfortable, abrasion resistant, fine-celled, hypoallergenic cross-linked polyethylene skin that is tacky-when-wet. These high-visibility, colorfast, yellow decks are UV-stable and resistant to chemicals, allowing them to be washed and sterilized with bleach, alcohol, and many detergents. On the flip side of the board, you will find an acrylic capped ABS hull with excellent impact resistance, permanently dyed in high visibility “Coast Guard Orange”. Proprietary high-impact potting urethanes and epoxies are used to weld tow bars, stringers, handles, and bungee anchors in place. The nose of every solid core LifeSled is capped with our super-tough UHMWPE Nose Guards that protects both the LifeSled and the PWC’s transom. Our robust, easy-to-grab handles are both internally and externally fiber-reinforced to stand on there own while offering just the right degree of flex. 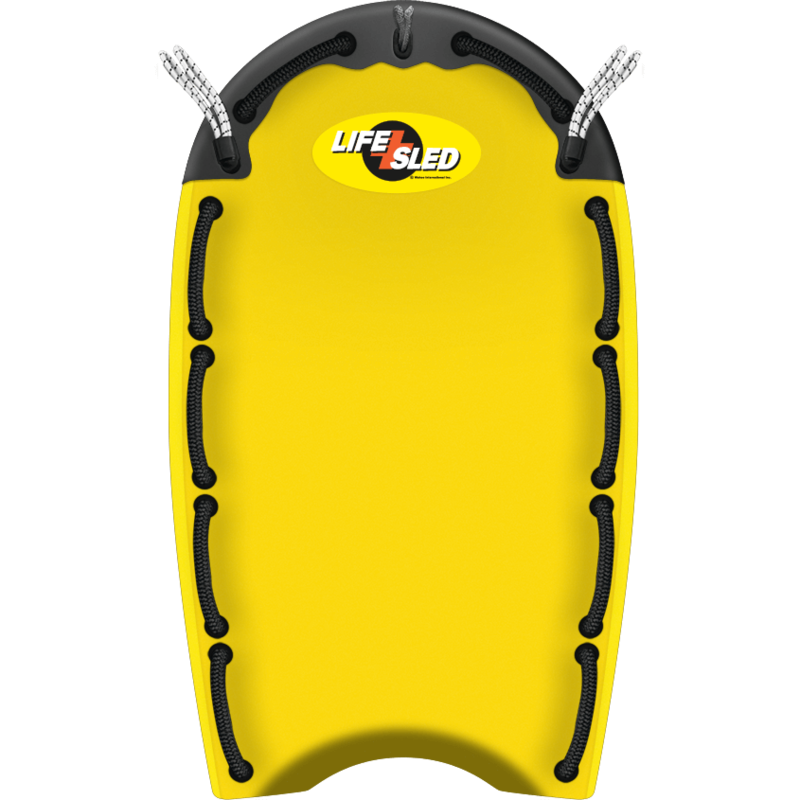 Unlike competing rescue boards with single 12mm bungee stabilizers, LifeSled’s Bungee Stabilizers have twice the strength and are made from double-looped, half-inch marine shock cord, and are double-sheathed for additional safety. While other rescue board manufacturers may scoff at the cost of our extreme material choices, we just can’t produce a life-saving board that cuts corners to increase profits. When lives are on the line, we are only interested in providing the best solution available. This carries over to all of our connectors as well. Simply put, the best way to add an anchor point to your personal watercraft is to install a Wichard Watertight U-Bolt. These u-bolts represent a significant advancement in u-bolt technology with its water-tight, UV-resistant, rubber collar. Vibration and noise are reduced to insignificant levels while the self-sealing properties of this simple, yet ingenious, u-bolt system keep your personal watercraft watertight. This marine grade 316L stainless steel has a load rating of 7,937 pounds and a break load of 15,432 pounds. Use in combination with our Bungee Carabiner Clips or Quick Release Snap Shackles to attach the rear sides of your jet ski to our Bungee Stabilizers. For setups that can’t take advantage of our custom-fit Transom Adaptors, we also offer a larger Wichard U-Bolt and a three-point U-Bolt kit. Dyneema is the world’s strongest fiber; strong enough to anchor cargo ships, we can think of no better way to anchor your LifeSled to a personal watercraft. Slim and lightweight, this loop is made from Ultra-High Molecular Weight Polyethylene and is used as the central tow line between your LifeSled rescue board and a jet ski. This 9,000 lb test line is the absolute best choice when using one of our custom fit Transom Adaptors. Attach one end to the transom’s tow hook using a bale sling hitch knot and the other end using either a Snap Hook Carabiner or our easy to use 70mm Quick Release Snap Shackle made from marine-grade 316 stainless steel. We know water rescue boards are expensive, life-saving investments; so we overbuild everything to last for many years to come and we don’t see why our tow rope should be any different. Keeping in step with offering only the most durable hardware, LifeSled’s super-strong, lightweight Bungee Carabiner Clips are rated to 5,290 pounds and are sealed in blue camouflaged paint. Like the name implies these four-inch aluminum carabiner clips are used to attach LifeSled’s marine-grade Bungee Stabilizers to the rear sides of a personal watercraft, completing a three-point connection. Use our watertight Small Wichard U-Bolts mounted to the body of your jet ski for the ultimate anchor point in which to attach the LifeSled Bungee Stabilizers in tandem with these Carabiner Clips. Another great alternative for attaching Bungee Stabilizers to the jet ski’s body are our easy to use 70mm Quick Release Snap Shackles forged from marine-grade 316 stainless steel. Our marine-grade 316 stainless steel quick-release connections allow for fast attachment of your LifeSled to a personal watercraft. The 70mm Snap Shackle is the best option for the central linking of a LifeSled to a boat when used with one of our custom-fit Transom Adaptors. The 70mm Quick Release Snap Shackles make quick attachment of a LifeSled’s Bungee Stabilizer to the PWC’s rear side U-Bolts. When a Transom Adaptor is not an option for a central connection, a 90mm Quick Release Snap Shackle is available à la carte as well as part of our U-Bolt Kit. Watching your personal watercraft being tossed about in heavy conditions is never funny, but knowing the doors that protect your jet ski’s water sensitive parts and electronics have been secured with LifeSled’s PWC Strap Kit might help keep your mind focused on your own safety. Our LifeSled PWC Seat Strap is comprised of a four buckle strap system designed to keep hood doors and seats from ripping off during heavy water roll-over situations. Even more costly than having to replace your water rescue board is having to repair a severely damaged jet ski. Jet skis with well-secured openings have been known to be quickly uprighted and back in action in no time at all. Designed for universal applications, this Strap Kit will fit all PWC makes and models and secures to the boat using Footman Loops and stainless screws. In rough water situations, there is no substitute for good grip. 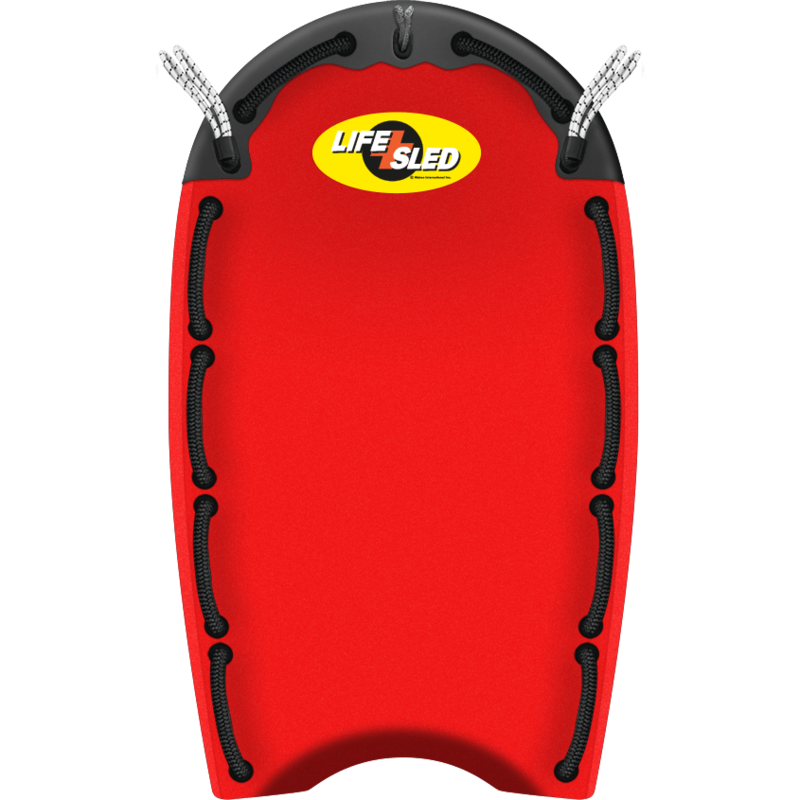 Unlike other competing rescue boards, LifeSled’s handles are internally and externally fiber reinforced and won’t easily compress into thin, hard-to-hold shapes that can pinch or hurt to grasp. Not unlike a race car’s steering wheel, our tacky-when-wet handles feature a robust diameter sufficient for victims with cold hands to grab hold of in hypothermic situations. Our semi-rigid handles stay upright and won’t easily collapse under minor weight like competing products, making them flexible enough to allow a victim to be hoisted over yet still firm enough to safely fence them in. The 750+ pound break strength allows victims to be carried similarly to a backboard. It is unlikely that these ultraviolet and weather-resistant handles will break or wear out anytime soon, but if they do, our handle’s modular design allows for single handles to be quickly and inexpensively replaced instead of all-at-once like our competitor’s sleds. The female end is embedded into the LifeSled’s core using a secret blend of adhesives designed for strength and impact resistance. Handles do not penetrate through the board’s hull and are not affixed with sharp, single-point screws. Because our handles don’t protrude through the bottom of the board, its hull remains smooth and intact for better tracking behind a ski. Our rescue boards Do Not Include Dangerous connected bungies or extraneous grab ropes that can whip at a victim, or worse yet, entangle them causing a rescue attempt to become fatal.